Sunday was my husband’s birthday. To celebrate, he wanted to go to the Renaissance festival in Holly, MI. (Yeah…he really had to twist my arm.) So we (along with the kids, my sister and his friend) hit the road early Sunday morning and drove to the fair. 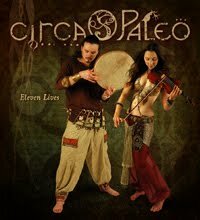 While we were there, we saw a lot of musical acts, but one in particular stood out far above the rest – Circa Paleo. These people are absolutely amazing. Not to sound all crunchy granola (right – when has that ever stopped me) but some musicians perform music and others embody it. These guys embody it. I know it sounds like a melodramatic cliche to say that the music came from their souls, but honestly, that’s what it felt like. Their joy was contagious and their skill superb. These are clearly people who love what they do and excel at it. I guess if I had to classify the genre, I’d call it World music. Maybe I’ve just had bad experiences with World music, but normally that term makes me think of hastily arranged traditional songs combined with odd, out of place synthesizer tracks or simplified arrangements that lack warmth and depth. Not so, with Circa Paleo. The melodies are beautifully layered with guitar, drums (hand and kit) and violin. The music is a rich tapestry combining Romany Gypsy, Celtic, Middle Eastern, Indian and others to create the perfect fusion of sound. Jenny O’Connor, Joshua Amyx and Jay Elkins are brilliant musicians. In the meanwhile, if you happen to be in the Plantersville, Texas area, be sure to check out a live performance at the Texas Renaissance Festival. You won’t be sorry! I’ll be posting faire pictures soon. Cool! I am buying the CD! You had me at super awesome writing music. I can't wait to buy their CD! The music is wonderful.